With Netflix’s focus on providing original content, an influx of new films that may not have been easily seen by the masses otherwise are hitting televisions (and computer monitors) all over. Even before Netflix provided a new platform, there was no shortage of horror movies. Perhaps more than any other genre, hundreds, if not thousands, of horror films are made, produced and distributed on small scales every year. Which begs the question, how is Netflix choosing which films to elevate and bring a wider audience to? This question remained in my mind while watching The Open House, one of Netflix’s newest additions to their original content line up. The Open House isn’t necessarily a bad film, but it is rather slow moving and a bit uninspired. The biggest strength of this film is its star, teenage “that guy”, Dylan Minnette (Goosebumps, Thirteen Reasons Why). Since Goosebumps, Minnette has broken out and his acting, as a craft, has bettered at every turn. 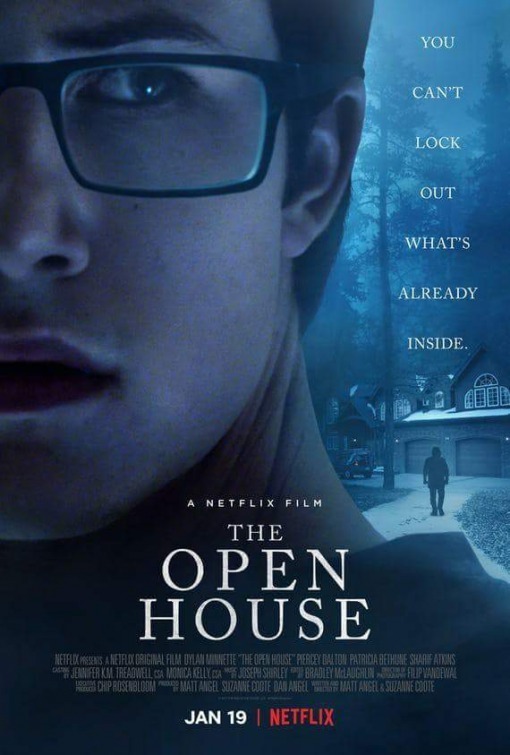 His role in The Open House begins as he witnesses the shocking, out-of-nowhere death of his beloved father, which leads to him and his mother packing up and moving to a mountain cottage (read: mansion), owned by his aunt. This bit of luck comes with just one small problem: it’s for sale, and must be vacated for open houses every Sunday. Minnette is solid and believable; there’s something about him that makes you root for him automatically. His performance is layered with grief and guilt, and his interactions with his mother, played by Piercey Dalton, show depth beyond his years. Dalton gives a strong performance as well, playing a woman who is clearly flawed and not dealing with the death of her husband well. Her character’s selfishness and inability to relate to her son or console him in his grief is one of the most refreshing, real things about the film. Both of the film’s leads give performances that outclass the script they’re playing. Matt Angel and Suzanne Coote’s script is rife with promise, but falters on its missed opportunities. Sometimes, not knowing exactly what you’re afraid of is part of the scare, but when it doesn’t work, it creates a muddled, confused, terror-less genre film. And sadly, that’s where The Open House ends up. The atmosphere, location, music and actors all work together to create a genuinely creepy ambiance that is all but lost due to the lackluster story. What made Netflix select this film? It’s possible the strength of the above mentioned positives pushed it into wider circulation, and honestly, that’s enough to set it ahead of many of the direct to DVD horror releases I’ve watched in my time. It’s just a shame that all of the other components weren’t enough to make The Open House any more than a boring, but well-acted, flop.